Those interesting in hearing the Plumas County Board of Supervisors’ decision on the acceptance or rejection of the Planning Commission’s proposal to ban commercial cultivation of cannabis nearly filled the supervisors’ chambers April 2. Only one person, Harry Rogers of Indian Valley, encouraged supervisor to vote against the ban. Rogers said he’s made his living raising medical marijuana for nearly 20 years. Plumas County Supervisors were expected to approve the addition of an ordinance banning commercial cultivation of cannabis at their regular meeting yesterday, April 9. That follows the legally required public hearing and vote Tuesday, April 2, to accept a proposed cultivation ban ordinance from the Plumas County Planning Commission. Supervisors unanimously voted to accept the Planning Commission’s Resolution 2019-2 to propose banning cultivation of commercial cannabis. The ban is for all unincorporated areas of Plumas County. Portola is the only incorporated area, but it too has discouraged cannabis cultivation within the city limits. The ordinance would replace a moratorium on commercial cultivation that is set to expire Oct. 19. It does not include cultivation of hemp nor does it interfere with allowing personal cultivation for up to six cannabis plants per household for medical and recreational purposes. California voters approved medical use of cannabis in 2010 with Proposition 19. Voters approved recreational use in 2016 under Proposition 64. 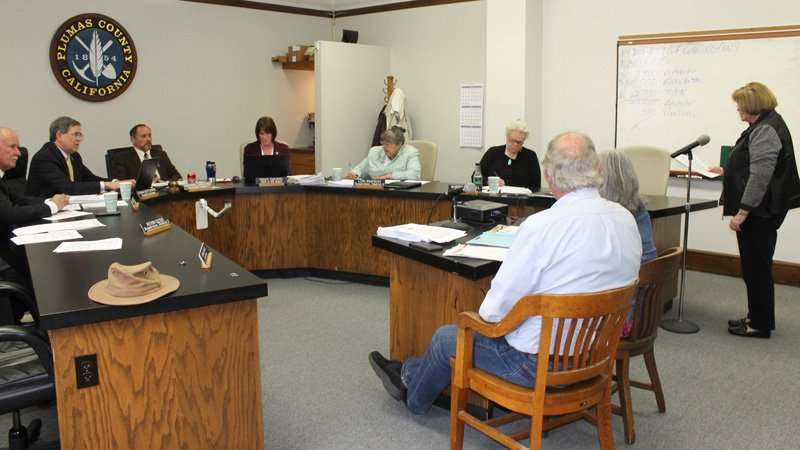 During the public hearing April 2, opponents of Measure B congratulated supervisors and themselves for nixing commercial cannabis cultivation in Plumas County. Two supervisors, however, clearly stated that their constituents had many reasons for voting no on Measure B. That measure was widely unpopular with voters during the November 2018 elections. While Supervisors Lori Simpson and Sherrie Thrall didn’t go into detail about voters’ reasons, growing wasn’t the only concern. “I think a lot of the people I’ve heard from, the voters roundly voted against commercial cultivation,” Thrall said as the first supervisor to speak. But she went on to say that she talked to many people “who told me why they voted the way they did,” so what some of what opponents of Measure B were saying wasn’t quite accurate, she added. Simpson said she too talked with residents who voted against Measure B for different reasons. Simpson went on to explain that while supervisors initially supported a working citizens group to iron out details of the commercial cannabis situation, no opponents were interested in joining that committee. What happened was that it became one-sided, representing the pro cultivation faction. Simpson said that it was time to move past the divisiveness that seemed to occur. The ban also doesn’t cover all aspects of medical and recreation use. “It can be delivered on any road (in the county) even if you have rules against it,” Simpson said about those who choose to have marijuana delivered to their door from another county. And it doesn’t cover dispensaries at this time. That and other considerations will need to be addressed with later study. Simpson said she remembers going to Quincy High School in 1975. “They were on the hill smoking it,” she said about the hill just behind the school. “They were in the hall smoking it,” she added about her understanding of the situation. “I don’t think it was a good process. I didn’t have fun,” Simpson reiterated. Supervisor Michael Sanchez, and chairperson of the board, said that he is retired Navy and that affects what he believes. He said that if something is illegal at the federal level then he’s against it. Sanchez said that he also did the math concerning expectations on what Plumas County could realistically make in taxes based on the commercial cultivation of cannabis. He explained that areas with much larger populations were seeing about a 1 percent tax revenue gain. “We would have to grow a lot here,” he said about the amount produced and sold for any financial gain to the county. Supervisors attempted to have a committee workout the details, but the “working group ended up being a one-sided free for all as far as I’m concerned,” Engel said about the process they initially tried. He added that the voters showed what they wanted and what they didn’t want in the results of Measure B.
Engel said that at this point with the six plants allowed per household for medical or recreation, people are covered. He said that he understands the medical benefits. “I have too many friends exposed to Agent Orange in Vietnam,” he explained and marijuana helped them with their aches and pains. Plumas County Planning Director Randy Wilson and Assistant Planning Director Becky Herrin were asked to present background information leading up to the Planning Commission’s March 7 vote to approve a proposed ordinance banning commercial cannabis cultivation. The first reading of the proposed ordinance was waived. It was Dec. 11, 2018, when supervisors approved a motion directing the planning commission to prepare an ordinance banning commercial cultivation. 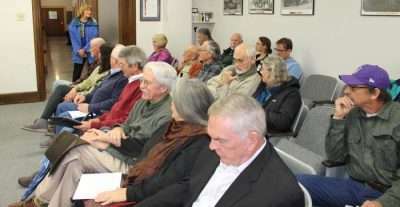 Toward that process, the commission held a public workshop Jan. 17 and then held the public hearing March 7. It was during the latter meeting that four members of the commission approved the proposed ordinance to take to supervisors. One commissioner, Moorea Hoffman Stout, was absent. Herrin explained that the proposed ordinance implementing a permanent ban on the cultivation of cannabis is consistent with the temporary moratorium ordinance. “The ordinance’s purpose is for protection of natural resources and public health and safety,” according to Herrin. “Therefore, it is exempt from the requirements of the California Environmental Quality Act under Section 15061(b)(3) because it can be seen with certainty that there is no possibility that the ordinance may have a significant effect on the environment,” she added. Some of the key changes within the proposal over Sec. 9-2.204 concern agriculture. It now stated that agriculture shall not include cannabis cultivation as set forth in Sec. 9-2.220.2. Sec. 9-2.220.1 Cannabis shall have the same meaning as set forth in Business and Professions code section 26001(f). Sec. 9-2.220.2 Cannabis cultivation means any activity involving the planting, growing, harvesting, drying, curing, grading, or trimming of cannabis (marijuana) plants or any part thereof as provided in Business and Professions code section 26001(1). Cannabis cultivation is declared a public nuisance that is subject to all remedies provided by law, including but not limited to abatement, administrative penalties, and other remedies as provided by Chapter 9 of Title 1 of the Plumas County Code. Sec. 9-2.249 provides a definition of horticulture and now includes that it doesn’t include cannabis cultivation as set forth in Sec. 9-2.220.2 of this section. Other sections include a definition of industrial hemp as it applies to Sec. 11018.5 of the Health and Safety Code and the definition of marijuana as being the same as cannabis set forth in Sec. 9-2.2201. Another change comes under what is considered a personal residence Sec. 9-2.267.1. It means a house, apartment unit, mobile home or other similar dwelling. Also there’s the inclusion of personal cultivation of cannabis explanation under Sec. 9-2.267.3. This means the personal cultivation of not more than six living cannabis plants by a person within that person’s private residence, or upon the grounds of that private residence, which are located in a locked space, and are not visible by normal unaided vision from a public place. Not more than six living cannabis plants may be planted, cultivated, harvested, dried or processed within a single private residence or upon the grounds of that private residence, at one time. Under Sec. 9-2.405.1, cannabis cultivation is defined in another section and is prohibited in all zones within the county. Cannabis cultivation does not include that defined as personal cultivation. Harry Rogers, the only person to attempt to sway supervisors against voting to accept the proposed ordinance, said that he’s spent nearly 20 years operating a medical cannabis collective in Indian Valley. “I believe that you, the board, jumped the gun when you went from a failed initiative, which was poorly written and confusing, to now going for a permanent ban on all commercial cannabis activities in the county,” Rogers stated. Rogers said supervisors should have gone back to the process that was started and come up with a compromise. Rogers went on to say that the state defines cannabis as an agricultural commodity. Medical cannabis is also identified as an agricultural product under the California Health and Safety Code. He also disagreed with the planning commission’s findings about the CEQA process exemption. He said that is a project as defined in section 15378(a)(1). The opponents of commercial cannabis cultivation chose to present different aspects as to why supervisors should approve the planning commission’s proposal. Joseph Munoz, retired Feather River College instructor and chair of the local Cannabis Citizens Group that opposed commercial cannabis cultivation, said that he appeared before the Board of Supervisors in 2016 and criticized them for having no cannabis plan in place. On April 2, he said he was there to compliment supervisors on their actions. Longtime Quincy attorney Peter Henschel addressed Supervisors breaking down the countywide vote on Measure B precinct by precinct. He said that most residents voted in a generalized manner against commercialized cannabis in Plumas County. Gordon Keller, who has lived in Plumas County for 40 years and is a civil engineer, said he is concerned about the water required for commercial cannabis operations. He also indicated problems with increased use of fertilizers, pesticides and potential cleanup costs. Richard Whitsell, a two-year Plumas County resident and a retired commercial banker with more than 40 years experience, told supervisors about his experience and the cannabis cultivation industry. Whitsell said that one of the major components, as with any crop, is supply and demand. Right now there is more being grown than what is being consumed. Indicating a March 19 story in the Sacramento Bee, Whitsell said there are 1,142 acres under state permit for cannabis cultivation. This could produce up to 9 million pounds of marijuana for 2019. The estimated demand is one to two million pounds per year. Whitsell’s reasons for being against commercial cultivation include that California has too many marijuana farms, the industry is producing more than it needs therefore prices will decrease, and most growers will face prices at a breakeven or loss rate. Another concern is that state and local tax revenue isn’t enough to cover the cost of the regulations. During his career as a commercial banker, Whitsell said that he lived in the “green triangle,” also known as Humboldt County. He was there from 1972 to 1973 and again from 1995 to 2000. Whitsell said that Garberville was “an idyllic community much like Quincy” in the early 1970s. It was “safe, strong, (showed) community spirit, (had a) healthy local business environment and good schools.” Its main economy centered on forestry, fishing, ranching and tourism. “Today, many of the pioneering families and locals have left the area,” Whitsell continued about his experience and observation about Humboldt County. “These communities, now a shell of what was once an idyllic community, are facing increased crime rates, local businesses are boarded up and an increasing homeless population,” is present. And longtime Quincy area resident Sharon Covington addressed supervisors with her concerns about cannabis use and a health perspective. “Communities that get cozy with commercial cannabis see impacts in social services, especially child welfare,” Covington said. Retired Plumas County Building Official John Cunningham reminded supervisors that voters have already spoken. “Please listen to those voices,” he said. Former Plumas County Supervisor Bill Coates congratulated supervisors on their open-mindedness. Coates said he had worked with many of the people who had spoken on the issues around commercial cannabis cultivation. He also held up a page that appeared in the four Plumas County Feather Publishing newspapers prior to the Measure B vote. Coates said it was his experience that those who listed their names as being against cultivation were also those who are actively involved in their communities. “It’s a fascinating community experience that we’ve been through here,” Coates said. He also called it a grassroots effort and added that he is proud of the fact that the county has always been a leader, and that it was standing solidly against the issue.